Governments Renew Commitment to Implement Farmers' Rights ! 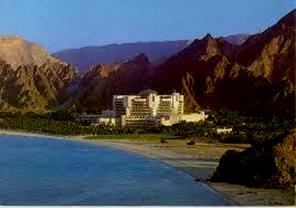 From 24 - 28 September, 2013 , the Governing Body of the International Seed Treaty (IT PGRFA) met for the fifth time (GB5) in the exclusive, chilled environment of the Al Bustan Palace Hotel, Muscat in the Sultanate of Oman. The results were promising � Civil Society and Farmers' Organisations helped stimulate commitment to essential changes in how the Treaty operates. This isolated location, far from forgotten farmers' fields that grow the biodiverse crops which feed the world, could have derailed the Treaty in, what Secretary Shakeel Bhatti described as, the make or break session of the Governing Body. In the event, the degree of unanimity of the African, Asian and Latin American blocs, with significant support from some European countries, and with united advocacy from farmers �organisations and CSOs present, all contributed to better outcomes than some had predicted.  a request to the Secretary to report on relevant discussions that relate to Farmers' Rights within other UN fora including the Committee on World Food Security . African, Asian and Latin American regions were the most united on Farmers' Rights that they have been since 1998/9 at the height of the negotiations on the Farmers' Rights article (Article 9). This solidarity forced through a good resolution on Farmers' Rights which commits governments, with the engagement of farmers' organisations and CSOs, to develop national action plans, review and adjust laws, and improve access to genetic resources. Funding for some of the inter-sessional activities is committed through the core budget of the Treaty, drawing from that assigned to implement work on the Sustainable Use of plant genetic resources for food and agriculture (Article 6) � an inter-related requirement for realising Farmers' Rights. Our Treaty should be at the heart of securing future food and agriculture through establishing effective governance of PGRFA that will enable farmers to continue to conserve, develop and sustainably use a wide range of crop biodiversity on-farm, at a time of increasing social, economic, environmental and political threats. The Treaty will be judged on whether it can stop the losses and improve access to existing PGRFA which has been developed by small-scale farmers in situ and on-farm. We appreciate the efforts of Contracting Parties at GB5 to reaffirm, in a new decision, their legally-binding commitment to the realisation of Farmers' Rights and improved access to PGRFA by small-scale farmers, and we commit to providing our analysis of the State of implementation of Farmers' Rights to the next GB. We look forward to participating in your intersessional work on FRs, so long as you can help facilitate this. The realisation of inalienable Farmers Rights, in the framework of food sovereignty will sustain the diversity of PGRFA on-farm and diversity of food on our tables. We are pleased that the Governing Body has opened a serious process to fix the glaring deficiencies of the Treaty's multilateral system. If there is no fix, the Treaty will become irrelevant. We welcome the understanding that improvements to the multilateral system will be user-based, and insist that all core activities of the new system be built upon mandatory contributions. In defining the strategic direction of the Benefit Sharing Fund , we reiterate that direct, demonstrable, and measurable benefits for farmers need to be prioritised. We call on country focal points to support, facilitate and endorse applications from farmers' organisations as it remains very difficult for them to apply for the Benefit Sharing Fund . We welcome the voluntary contributions made by Norway, Italy, Spain and the European Union. The Treaty has the responsibility to ensure support for small-scale farmers in their task; the Treaty's future depends on this. We urge the GB to assume this responsibility; w e look forward to collaborating with the Secretariat and Bureau, inter-sessionally, and to purposeful mutual engagement in the next Governing Body meeting. CSOs and farmers organisations, will continue, in the face of many challenges, to take our responsibilities: we will resist, we will organise and we will transform the seed and food system so that our Farmers' Rights and food sovereignty are realised. 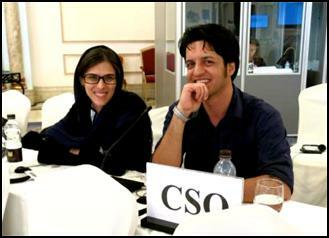 The IPC was allocated a Side Event slot on Friday 27 September by the Secretariat. 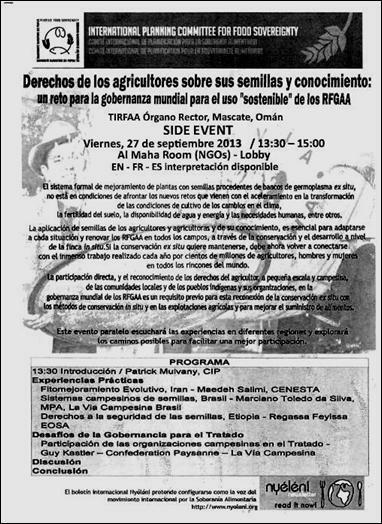 The title of the event was Farmers' Rights to their seeds and knowledge: a challenge for global governance of the �sustainable' use of PGRFA. We were fortunate to have excellent speakers from: CENESTA, Iran; MPA, Brazil, EOSA, Ethiopia; and Via Campesina, and to have very good interpretation. About 50 people attended the event, for all or part of the proceedings, including about a dozen country delegates. For anyone interested in involvement in the intersessional process up to GB6, please get in touch patrickmulvany@clara.co.uk . Also recalling resolutions 2/2007, 6/2009 and 6/2011. 9. Requests the Secretary to facilitate support to such initiatives upon request. 10. Invites Contracting Parties and development cooperation organizations to consider providing financial and technical support for the implementation of Farmers' Rights as set out in Article 9 of the Treaty in developing countries, and to enable farmers and representatives of farmers'organizations to attend meetings under the International Treaty. 13. Welcomes the offer from a farmers' organization at the Fifth Session of the Governing Body to provide a report on the implementation of Farmers' Rights to the next session of the Governing Body. Thank you Chair for inviting us to speak. I am Wilhelmina Pelegrina, speaking on behalf of peasant groups and civil society organisations present in the 5 th Governing Body Meeting of the International Treaty. I will make a few brief comments and then pass on our intervention to my colleague from Via Campesina, the international peasant movement. We appreciate the candid and honest reflections by the Chair and Executive Secretary in their reports. We wish to be part of the process to find a solution, contributing ideas and proposals about how the Treaty can realise its challenging goals. We recognise that the Treaty and its Secretariat have contributed to improvements in the awareness of the central importance of PGRFA to food security, nutrition and environmental sustainability, and about technical developments in, for example, participatory plant breeding as a component of plant breeding strategies with a growing acceptance that farmers are plant breeders, and increased recognition of the role of community seed banks. But the Treaty needs to find ways to refocus its work on improving sustainable use, access, benefit sharing and, crucially, Farmers' Rights. Since the Treaty's existence, recognition of Farmers' Rights has actually declined and there have been no improvements in germplasm flow to farmers. Resource grabbing, biopiracy and pressures to privatise public goods, including genetic resources in public genebanks, is increasing with native traits, including those found in Annex 1 crops, being continually patented in, for example, the USA, South Korea, Australia and the European Union. While the 2008 food price crisis and climate change have provided opportunities to increase support for research into food and agriculture, this has not translated into support for advancing diversification of PGRFA on-farm and in situ , even though this will strengthen the resilience of farms and the food system. The Treaty does not seem capable of challenging these negative trends and this raises questions about future of the Treaty. Therefore, as the Treaty prepares for its second Decade, we call on GB5 to implement a process that will lead to fundamental changes in the Treaty and its procedures, and will gain the support needed, to address the challenges. I am Guy Kastler from Via Campesina. As part of this renewal process, we would insist that increased participation by representatives of farmers' social movements, and CSOs that support them, is essential for the future of the Treaty: it is as a result of the work of small-scale biodiversity-enhancing farmers, operating within the principles of food sovereignty, that we have the PGRFA which feed the world. The rights of farmers to participate in decisions regarding PGRFA cannot be realised by governments selecting one or two NGOs to ask a few questions or to internet-based consultations, to which most farmers do not have access. We recognise that Contracting Parties are responsible for decision making but we propose that the work of the Treaty would be greatly enhanced if the views of representatives of farmers' social movements, and the CSOs that support them, were better integrated into the debates in the Governing Body and in inter-sessional processes. Since GB4 in Bali, the engagement of farmers' social movements in your work has been difficult and benefits flowing through the Treaty to farmers organisations have been minimal. In all the meetings of the GB we have organised ourselves and have presented our ideas and proposals on different agenda items but our contributions are marginalised to the end of your debates. In many parts of the UN system, new ways of working with CSOs are being implemented, which address this deficit, including through the Civil Society Mechanism of the Committee on World Food Security, a process endorsed by governments in Rio+20. The CBD is developing an improved mechanism and the UN General Assembly is, this week, considering how UN bodies can better engage CSOs in normative decision-making processes. While we accept that the Treaty needs to have clear rules - as an instrument which is legally-binding on governments � this should not prevent you from defining and implementing new rules for the participation of civil society organisations, and especially of farmers' representatives. 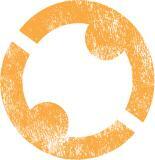 We call on the GB to put in place an improved mechanism for CSO participation in your processes. We are from CENESTA, an Iranian NGO involved in participatory and evolutionary plant breeding with farmers, speaking on behalf of the CSOs and farmers' organizations who are present at this fifth session of the Governing Body, in the beautiful Sultanate of Oman � we thank our hosts for their generous hospitality. We welcome this opportunity to make a concluding statement and would like to thank you, Chair and the Secretariat, for facilitating our involvement in this fifth session of the GB. At the 4th session of the GB we hoped that Contracting Parties would resolve to find the means and political commitment to make the Treaty work in the interests of the key users and developers of PGRFA � the world's small-scale farmers, who feed the world, but, frankly, since then, not much happened. The realisation of inalienable Farmers Rights, in the framework of food sovereignty will sustain the diversity of PGRFA on-farm and diversity of food on our tables. Small-scale farmers across the world take on the responsibility of renewing their fields and feeding us with the vast biodiversity of their crops that they inherited from their parents and will pass on to their children. But they cannot accomplish their contribution to our food and agriculture if their rights to save, use, exchange and sell their seeds are not respected and protected and upheld, and if they cannot participate in decision-taking. At the same time, the future of many public genebanks is threatened: some are destroyed by wars or lack of funding; others get privatised and abandon many accessions; many intellectual property rights are granted on traits and genes found in stored seeds, which are then no longer accessible to farmers. Meanwhile, the Treaty provides free access for industry to all the seeds, covered by the MLS. Farmers have already provided all their seed materials to the world for free. The seed materials they continue to create are also free. It is a disservice to farmers, who continually feed us to receive only scant benefits from the treasure they provided the global community. Small-scale farmers cannot adapt their production to climate change and defend their resilient production systems, which are not dependent on external inputs, if they have to rely on commercial varieties and do not have access to their diverse seeds. We are pleased that the Governing Body has opened a serious process to fix the glaring deficiencies of the Treaty's multilateral system. We see this decision is based on the widely shared conclusion that the current system has only minimally generated access and benefit sharing and will need radical reform if it is to do so in the future. If there is no fix, the Treaty will become irrelevant. We welcome the understanding that improvements to the multilateral system will be user-based, and insist that all core activities of the new system be built upon mandatory contributions. We regard, with caution, the decision to potentially "enhance" the functioning of the Multilateral System, and reiterate that benefit sharing must be demonstrably fixed before discussion of "enhancement" begins. If and when that time comes, the first considerations should be both to prevent pillaging of the System by patents on native traits, and to open the doors of private PGRFA collections � a well-kept secret � if the Treaty intends to retain facilitated access for industry in the future. The decision taken at this Governing Body is the first step to create a new and viable Access and Benefit Sharing mechanism. We appreciate being afforded some opportunity to participate in this process. This is a move in the right direction for the Treaty, which should ensure that this inclusion is facilitated and consistent. We therefore look forward to the intersessional process in order to contribute to save this Treaty and its Multilateral System. In defining the strategic direction of the Benefit Sharing Fund, we reiterate that direct, demonstrable, and measurable benefits for farmers need to be prioritised. We call on country focal points to support, facilitate and endorse applications from farmers' organisations as it remains very difficult for them to apply for the Benefit Sharing Fund. We welcome the voluntary contributions made by Norway, Italy, Spain and the European Union. We believe, however, that the Benefit Sharing Fund needs to evolve from a voluntary grant mechanism to a mandatory fund that will support increased in situ and on-farm efforts by small-scale farmers worldwide to conserve and develop PGRFA towards the realisation of Farmers Rights. The perilous convergence of a rapid erosion of PGRFA on-farm and Climate Change, among other threats, call for radical and profound responses if the biodiverse, nutritious and resilient production systems of small-scale farmers, who provide food and nutrition for most people in the world, are to be sustained. If the Treaty cannot realise its declared purposes of the conservation, sustainable use and benefit sharing of PGRFA, we would question its relevance. The Treaty has the responsibility to ensure support for small-scale farmers in their task; the Treaty's future depends on this. We urge the GB to assume this responsibility; we look forward to collaborating with the Secretariat and Bureau, intersessionally, and to purposeful mutual engagement in the next Governing Body meeting. Chair, let us conclude by saying that we, CSOs and farmers organisations, will continue, in the face of many challenges, to take our responsibilities: we will resist, we will organise and we will transform the seed and food system so that our Farmers' Rights and food sovereignty are realised. We request that our full statement be added to the report of this meeting.